After starting the year with relative peace, the Uptown neighborhood has seen a sudden surge in shots fired incidents since two men were shot in the 1000 block of West Argyle on March 19th. A 24-year-old woman was shot in her right leg as she was walking with two other people in the 800 block of West Agatite around 10:15 p.m. on Tuesday. Shell casings from two different caliber weapons were found about 100 yards west of where the victim and her companions were standing, suggesting that two people may have fired shots, according to an officer at the scene. Police said the victim’s condition was stabilized at Advocate Illinois Masonic Medical Center. No offender information was available. 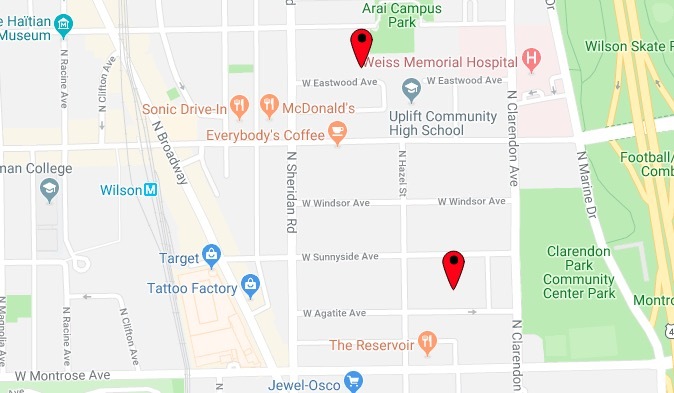 Another incident on Sunday evening resulted in several people being shaken up, but no one injured after shots were fired in the 900 block of West Eastwood, about four blocks from Tuesday’s shooting scene. In that incident, witnesses reported that two men drove a Jeep Cherokee into an alley around 10:25 a.m. The men emerged from the Jeep and opened fire with a silver handgun. They then returned to the vehicle and sped away westbound. The Jeep is has a “blackout” package with dark windows, black rims, and a black paint job, the witnesses said. One offender was described as a skinny black male in his late teens who stands 6’3” tall. He was wearing a puffy dark gray jacket with a white hoodie underneath. Another suspect is a slender, younger-appearing black male who stands about 5’10” tall. He was wearing all black clothing.